Finding your way around Crete will not be difficult as there are many public means of transportation providing you all the necessary transportation means to work your way around the island. The traditional way to go from one city to the other is with no doubt the conventional bus that is both regular and convenient and has a scheduled timetable. The island of Crete in general has an excellent and more importantly wide road network and especially during the hot summer months and the peak of the touristic season you will find the bus network even more frequent in order to serve all the travelers and offer them quality transportation. 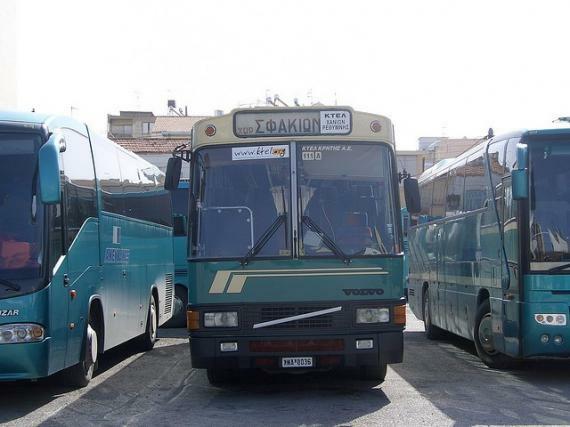 With a national bus service called KTEL that is cheap, safe and reasonably punctual, in Chania you will find everything you need and more importantly you will be offered the chance to move around the island and not stay at one place. Find the station of KTEL from where you may get to see as much of the island as you possibly can by traveling to other places in Crete. For example, the center of Heraklion offers you the chance to have your coffee at the heart of the busy city or walk in the narrow streets of Rethimnon or get to see the Old city of Chania. All these places do have an hour drive distance between them and you will have to take the bus in order to get there. Apart from the basic route to the other big cities of the island (Chania - Rethimnon - Heraklion - Malia - Agios Nikolaos - Sitia) you will find your way to Kasteli-Falasarna twice a day in order to swim at the famous beach of Falasarna or explore the area’s beauty any way you can. If you wish to be sure about the time of departure you can always check the timetable with the locals or ask the station, only to make sure you will not miss having the time of your life in Chania.